It's been 6 full months since we've had any direct contact with the outside world. No visitors, no planes, no airdrops. There is no new "stuff" to be found anywhere on station - we're developing the ultimate anti-consumer culture. Having said that, you can't begin to imagine the thrill which comes with the discovery of something new. Back in December, my mother put together a series of small care packages, and shipped them all down before station close. They're each labeled with the month they're meant to be opened in, and I keep them carefully squirreled away at the bottom of my closet. The past couple of months, I've been looking forward to the first the way a 7-year-old looks forward to Christmas, giddy and excited for the ~$5 worth of stuff I'll be getting. Those packages, along with others send by friends, are wonderful, and all give huge boosts to my mental well being, but a couple of days ago, I got a true surprise. An email came from one of my collaborators (also a good friend) asking me to phone him because he had to locate some of the holography equipment used to align the panels on the telescope. I gave him a call when the satellites came up later that morning, and he described the package he needed me to find and look inside. A couple of hours later, I managed to track down the "Sensitive Holography Equipment" tucked in the back of one of the many closets used to store spare parts for the telescope and equipment for summer work. It was an oddly wrapped bundle, which I'd come across earlier in the season but never gave another thought. 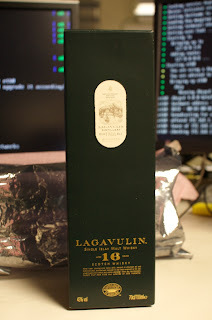 On unwrapping it, I was surprised and delighted to find - not sensitive holography equipment, but a bottle of excellent scotch which several friends had conspired to hide way back in the summer! A little bit of luxury to help me get through the toasty months. After reading of my recent illness and practical incarceration in my room, it was decided the time had come to unveil the present. Just to be clear on one point, it's not the alcohol which is so nice to receive. There's plenty of liquor on station, and if I really wanted to get drunk, it wouldn't be a problem. There has been no new food or drink on station since February, and while the galley staff is certainly talented, after 6 months the limited flavors of frozen food start to get old. A bottle of Lagavulin is such a nice surprise because it's such a wondrous luxury to have a new consumable, a fine scotch to sip. Somewhere along the line, I did something right in choosing my friends. 'Sensitive Hologrphy equipment' - No joke, my first thought as I read that was a sarcastic, "What is it? A bottle of scotch?"